The Lives You Touch Publications 2011 - 2012 Chapbook Series Manuscript Submissions period is now open. It will close on March 31, 2011. Visit Touch The Journal of Healing, http://www.thelives=youtouch.com/, also linked at Advice From The Pros, 17. e-Zines By The Dozen, http://tinyurl.com/32lag6w. Sprague and Sullivan, Spokane, WA: Sat. Jan. 29th - 1 p.m.
S. Hill-29th. and S.E, Blvd., Spokane, WA: Sat. Feb. 5th -1 p.m.
Auntie's Bookstore, Main Ave., Spokane, WA, Sat. Feb.12th - 1 p.m.
For the last twenty years, Katie Youngren has written poems and songs, but she has never considered writing books for children. One day, however, during her work as a bus driver for Freeman School, she and co-workers found a kitten. As she often does, Katie wrote a poem and took a few pictures. A friend suggested it would be a nice story, and Katie realized that children's books "just plain made sense," she said. "I took the poem and pictures to Typecraft Inc., http://www.typecraft.net/, where Shelley worked her 'magic' with layout and design." Freeman Press published Itty, Bitty Schoolbus Kitty Dec. 17, 2010. The story about the stray kitten at the school in the Palouse farming region twenty miles south of Spokane Valley relates how a group of caring bus drivers rally to give the feline a better life. The target audience is primary ages. "I absolutely adore kids and I get a huge kick out my bus kiddos," she said. Katie chose perfect binding (glued) rather than staple binding, because it holds together longer and looks good to book sellers. She also chose card-stock paper. Even though these options cost a little more, she's happy with the results. However, the uninitiated author would soon discover what she wished she'd known earlier about bookmarketing. Jean Corder, Book Manager, Barnes and Noble, Spokane Valley Mall, told Katie to buy an ISBN and a Bar code. The $150.00 ISBN, http://www.bowker.com/, or http://www.myidentifiers.com/, book-identifier is required before Barnes and Noble considers stocking a book. Katie was on a fast-track learning curve. She recommends purchasing the ISBN and Bar codes before printing a book so the printer can put it on the back, instead of getting stickers like she did and having to put them on. 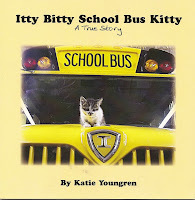 After publishing Itty, Bitty Schoolbus Kitty, Katie considered looking for an illustrator for her other poems. Most of her poems are geared toward children, and her 'kids' have provided some of her best material. "Art Linkletter was right," she said. Kids really do say the darndest things. And it's amazing how many adults also enjoy Itty, Bitty Schoolbus Kitty, especially cat fanciers." The quest for an illustrator began with a personal reference. "A good friend of mine introduced me to her brother, Mike Houbrick, and said he might be able to help me. Mike is a wonderful illustrator who had just begun working on some of his own projects. "Wow! Little did I know that he was a former Universal Studio employee who had worked with countless celebrities as an agent and guide in show biz! He described himself as the guy on top of the building who can see the parking space closest to the door, while the rest of us are driving around looking for it. He believes it is a gift from God and he uses it to help others. I believe him! "He advised me to put the poems on hold and focus on the kitty book, saying it had great potential. I did not see that coming. He told me to get a trademark and send copies of my book to the newspapers and television stations. I am following every bit of Mike's advice, and it is paying off." "I got a phone call from the Spokesman-Review yesterday (Friday), and they want to do an interview this coming Wednesday, complete with photos, at the Freeman bus barn! Woohoo! I owe Mike a mountain of thanks, and the bonus is that I now have a wonderful, new friend to boot." Katie, who spent much of her childhood at Donut Parade in Spokane, a business owned by her parents. Katie later drove a Spokane Transit Authority bus for 15 years. She retired early to be at home for her children. She and her husband, Karl, lived in Spokane Valley, WA and raised six children before moving with two of their daughters to Valleyford, WA in April 2008. She loves it there, and began driving school bus for Freeman the fall of 2009, as a substitute driver, and was offered a full-time position in the fall of 2010. Katie is also a musician, singing at churches, weddings, and funerals. "I sang in a band called 'Strive' for a time and had gigs at the Union Gospel Mission. The residents enjoyed our original, folksy gospel blues. That was a hoot! My daughters, Karly and Katie Mae, and I sing three part a cappella harmony when we get the chance. They are so talented, and we call ourselves 'The Lilies of the Valley'." The Youngrens have three grandchildren, Charlie, Emery and Sofia. Katie loves being a grandma. Three of their four sons are married. And they have a golden retriever, Jorge, that is great friends with the cats, Angel, Pearl and Daisy and the itty bitty kitty, Eve. "I am active in my Valleyford Community Church and have the sweetest, most supportive church family around. I love to play my mandolin, although I'm still learning, and I have a beautiful violin hanging on my wall collecting dust that I would love to master someday. "It is my hope and dream to continue to write the series of Itty Bitty, God willing, and to share more true adventures of her with her fans. I have some great ideas in the "hopper", so stay tuned! It just seems that God is leading me on a path He intends for me to follow. I can't think of anything else I would rather do. Katie's face is always alight with laughter, and her book reflects that inner joy. 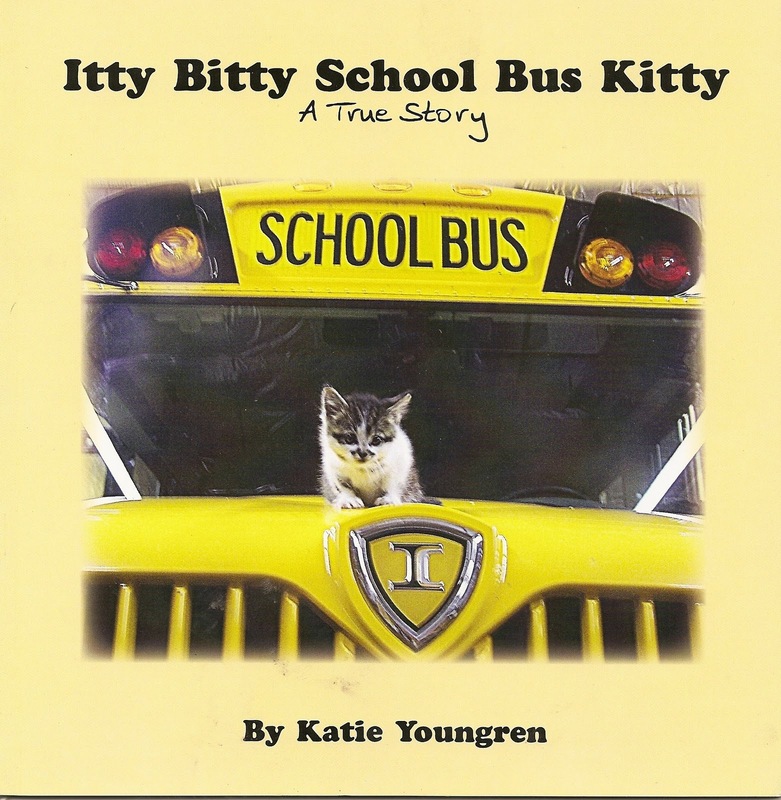 She awoke one morning shortly after her childrens book release inspired with the words to a song and its musical score: Itty Bitty Kitty Ditty to accompany Itty, Bitty Schoolbus Kitty. Katie certainly seems headed for a fantastic new career. She laughs and says, "Who knows?" Within days, her vivid imagination had produced a plethora of ideas to pursue. Maybe she'll create a whole line of items related to her Itty Bitty Kitty(R) trademark. "The tiny kitten? Found hunkered under a dumpster, she was so tiny her eyes were just barely open," Katie said. "We named her Eve, and today the vet says her teeth say she's 41/2 months old, but her weight says she's 51/2 months, so she may grow into a large cat. Isn't that ironic? I guess it all just proves that when people care about a tiny critter (or anyone for that matter), with a little love and nurturing, their potential for growth and to be all that God meant for them to be can be HUGE!"